8.- Seville, 1929 and 1992. It is in the second half of the XIXth century that the city initiates a new expansion by the construction of a railroad. Seville demolished part of its ancient walls and grew outwards to the east and the south. We speak of the nineteenth century extension, completed in the first decades of the XXth century with buildings constructed for the occasion of the latin american exhibition of 1929, for example, the Plaza de España and the Gardens of Maria Luisa. One must wait until the XXth century to get a glimpse of a modern Seville; the exhibition of 1929 and the Universal Exhibition serves as a platform of world-wide fame both as a modern and traditional city. 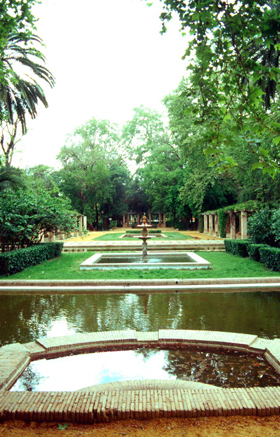 The XXth century is the century that modernizes Seville; the district of santa Cruz is rehabilitated, the district of Nervion is built, the avenue of la Palmera is laid out, the gardens of Maria Luisa are extendedand improved. However, in spite of this hopeful beginning, after the Latin American Exhibition of 1929, the civil war and the long postwar period marked by the regime of the dictator Francisco Franco situates seville once again in a clear position of decline. Once democracy was restituted, the Universal Exhibition of 1992 was celebrated. 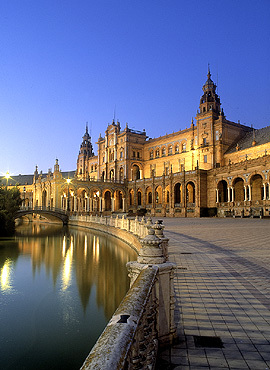 For this reason the city of seville has in the last years been favored with great initiatives on a grand scale promoted by different public administrations as well as the private sector. Very important investments in transport infraestructures and communications have been carried out; restoration of the old historic quarter, the increase of hotel services, new cultural, sports and commercial venues constructed. Also the recovery of the river and the harbor facilities and joining the road framework with squares and avenues, etc.